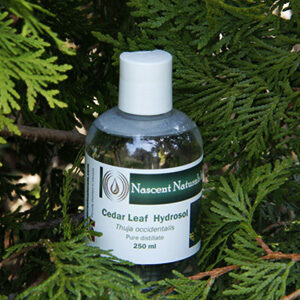 Witch Hazel Hydrosol – Nascent Naturals Inc. The origin of the name has nothing to do with women in pointy black hats flying around on brooms, rather the original term “wych”, (flexible) as a referral to the very flexible aspect of the tree especially in high wind, and the type of nut which is produced commonly known as “hazel nuts”. Used for centuries by Native North Americans, and a staple in many medicine cabinets, the water derived from this small tree (Hamamelis virginiana) has long been used as a remedy for itchy, inflamed, dry, sunburned, swollen, and damaged skin. 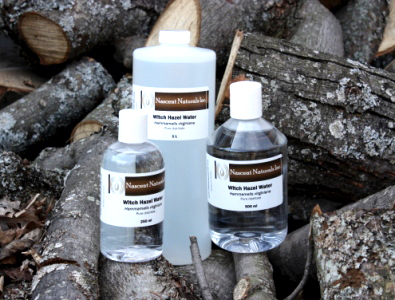 Twigs, bark and leaves are all distilled to create a “Hydrosol” ( a water soluble liquid containing trace elements of the healing properties within the plant), which include tannins, flavonoids and other organic acids. These vital elements provide cicatrizing, antiseptic and astringent properties. This also produces a tightening and toning effect on the skin by cleansing, clearing and tightening enlarged, black pores. Also reputed to refresh tired achy (and smelly) feet, reduce swelling and itching of poison ivy and bug bites. It’s even used in hemorrhoid preparations as it shrinks swelling! Mix 50/50 with distilled water then add a small amount of glycerin and or apple cider vinegar, aloe juice (less than 5%) to create a skin firming and softening toner. This concoction can also be used as a disinfectant wash for wounds or add to a spray bottle to calm down nasty sunburns and poison ivy. Add a small amount (up to 10%) to a plant based cream, lotion or facial cleanser to improve skin tightening and antiseptic properties. **Be sure to only use pure distillate since many brands of witch hazel purchased commercially are simply concentrated extracts blended with water and harsh alcohols (up to 30%) that may cause excessive drying, irritation and strip the skin of natural oils. Hydrosols – A by-product from the distillation of essential oils. Most common are orange blossom, rose, lavender, rosemary and chamomile. If an essential oils has been distilled then its hydrosol exists. In most cases, hydrosols are very pleasant and friendly to the skin. These waters are mildly antiseptic, astringent, and lightly fragrant. They can be applied directly to the skin as a toner, mixed with creams, in facial compresses, lotions or used as a body splash. A great alternative to essential oils when treating children and are often referred to as the ‘gentle aromatherapy.’ When possible, use instead of just water. 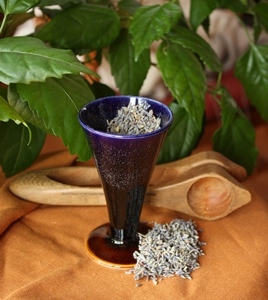 Conversely, a plant can be distilled which does not produce an essential oil, but does have aromatic and therapeutic properties such as witch hazel or sweetgrass.